​ Singapore, with its high raises, interesting history, luxurious buildings, diverse culture, great food options and amazing shopping opportunities, is one of the most-sought after holiday spots in the world. Apart from the city, many people choose to go to Singapore for holiday for Sentosa Island. A military base and prisoner war camp of the past, Sentosa Island, today, is dedicated to fun and entertainment. Complete with beautiful resorts, opulent hotels, adventure parks, beaches, restaurants and various other attractions, Sentosa Island has everything to make your holiday a memorable one. Even if you choose to stay at Singapore city or one of the hotels on the island, Sentosa Island should be part of your itinerary. Here is what you need to know about Sentosa Island to make your visit the best. There is no dearth of interesting places to visit in Sentosa Island. Here are a few places that are the most important attractions of the island. The first Universal Studios in Southeast Asia, this popular adventure park is located inside Resorts World Sentosa. With 7 zones, 28 rides and numerous shows, the Universal Studios would not fail to entertain. The zones that you need to check out here include Hollywood, New York City, Ancient Egypt, The Lost World, Far Far Away and Madagascar. The Tiger Sky Tower is a free standing observation deck on Sentosa Island. Standing at the height of 360 ft., the observation deck on the tower gives you an unparalleled view of the entire island but also of Singapore city and the nearby southern islands. Located at the centre of Sentosa, you can easily reach this tower via luge chair lift, cable car, internal bus, etc. The S.E.A. Aquarium is part of the Marine Life Park inside Resorts World Sentosa. The second largest aquarium in the world, the S.E.A. Aquarium is home to 100,000 marine animals amongst 800 species. Some of the inhabitants of the aquarium are Indo-Pacific bottlenose dolphins, the Japanese spider crab, giant oceanic manta ray, etc. A visit to this aquarium is interesting as you would get to explore 10 zones and 49 habitats. This is something that would appeal to both kids and adults alike. Fort Siloso is the only historical place on Sentosa Island. If you love to explore the history of the place, a visit to the fort would give you a glimpse of the life of a soldier of the past. The tour involves a visit to the underground ammunition stores where you can check out the guns used during the Second World War. A visit to the Surrender Chambers is also extremely interesting. Sentosa has three man-made beaches and each one of them is beautiful in its own right. If you want to take a break from the numerous attractions of the island, head to one of the beaches on the island which include Siloso Beach, Palawan Beach and Tanjong Beach. Siloso is popular for its water sports while Palawan is the best family-friendly beach. Visit Tanjong Beach and Siloso Beach after sunset, if you want to enjoy amazing beach parties. If you are looking for free things to do in Sentosa Island, the Crane Dance is your answer. This show happens every night at 8 in the Resorts World Sentosa. Known to be the largest animation show in the world, you get to see the love story of two cranes. The beautiful movements of the cranes amidst colours, sound and lights would definitely leave you mesmerised. There is no age limit to watch this age and would be enjoyed by everyone. Have you always wanted to try sky diving but haven't yet found the courage. Take a step towards your ultimate goal by trying indoor sky diving at Singapore iFly. While you do not have to jump from aeroplanes or learn to use the parachute, the experience of sky diving is the same. If you are a beginner, you would receive a training session, flight gear, training from a flight instructor. As it is extremely safe, even kids can try indoor sky diving at iFly. The adventure parks and other attractions in Sentosa may make it seem to be a place only for kids. However, this is far from the truth. When the night sets in, adults would have a great time visiting the clubs and enjoying the night parties. The places in Sentosa where you can have an amazing time include Mambo Beach Club, Tanjong Beach Club, Bikini Bar, Resorts World Sentosa Casino, Azzura Beach Club, Hard Rock Cafe, Cove Stadium Bistro and Sports Bar, etc. ​ Where to Stay in Sentosa? As Sentosa Island offers some marvellous attractions and entertainment options, you would want to stay on the island to enjoy the place fully. If you choose to do so, there are myriad of hotels to choose from. The Resorts World Sentosa itself has seven hotels, out of which the most popular ones are Crockfords Tower, Equarius Hotel, The Hard Rock Hotel, Hotel Michael, etc. Few other great hotels that would make staying at Sentosa really comfortable include ONE15 Marina Club, Sofitel Singapore Sentosa Resort & Spa, Capella Singapore, etc. Whichever hotel you choose to stay on Sentosa Island, you are guaranteed to experience great hospitality and customer service. ​ Where to Dine in Sentosa? Dining in Sentosa is a delight just like anywhere in Singapore. The island has several fine dining and casual restaurants. Also, there are several eateries and food outlets in the malls on the island. If you are craving for Chinese food, head to Blue Lotus Chinese Eating House, and head to Il Lido for an authentic Italian fair. The Malaysian Food Street would not only give you a taste of Malaysian cuisine but also the ambience of a Malaysian hawker street. If you are looking for a romantic experience along with a delicious dinner, opt for Faber Peak for a dinner date on a cable car that would take you from Faber Peak to Sentosa and back. Few other popular restaurants here include Prive Cafe, Prive Grill, Kebab House, Saint Pierre, Si Bon, etc. 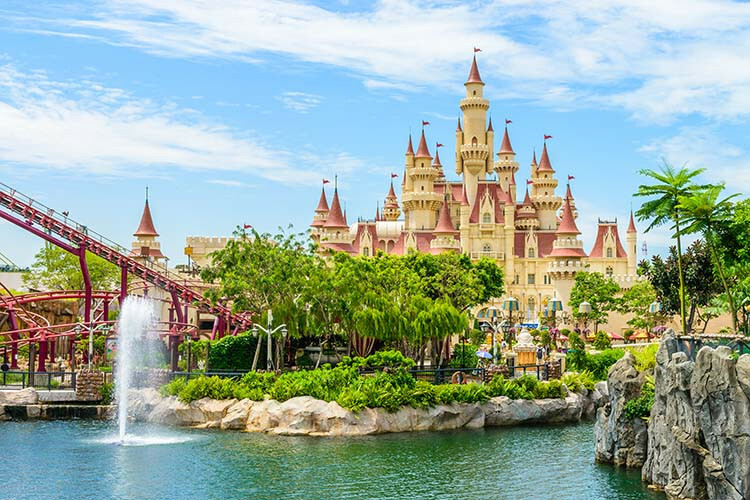 While knowing where to go, what to do and where to stay are important, you need to have some simple but yourself information to have a comfortable and successful trip to Sentosa. Here are some useful tips that you should keep in mind when travelling to Sentosa Island. Taking the Singapore cable car is the best way of reaching Sentosa Island from Singapore. Not only is the ride thrilling, the view from the cable car is also amazing. If you are not a fan of heights and do not want to opt for the cable car ride, you can reach the island by taking a private vehicle, public transportation and bicycle. You can also reach the island on foot. To commute within Sentosa Island, you can choose trams and buses. They are the easiest an efficient ways of travelling from one place to another. Buying a day pass for Sentosa Island is a great way of saving money and planning your visit of the island. But make sure that you complete all the rides offered on the day pass before 7 in the evening. The climate on Sentosa Island (as well as anywhere in Singapore) is pretty warm. Hence, carry comfortable, cotton clothes with you. As you would be walking around a lot on the island, do not forget to wear comfortable shoes during your trip. As you now know a lot about Sentosa Island, planning a trip to this place would be easier. If you find Sentosa intriguing, apply for a Singapore visit visa today, to explore the island which runs purely for pleasure.